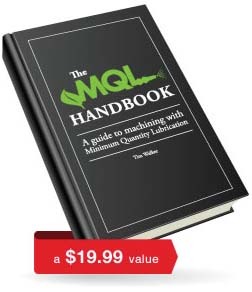 For a limited time, get the MQL Handbook Free! Is Minimum Quantity Lubrication Right for you? Find out with the MQL Handbook. Minimum Quantity Lubrication (MQL) is nothing new. In fact, it's widely accepted in European machining where strict environmental regulation makes going green less of a choice and more of a fact of life for metalworkers. MQL has a proven track record in working just as well as, or better than, traditional flood coolants and without costly negative consequences like health hazards, disposal costs, pricey circulation equipment, and mess! Yes - Send me important Unist news/updates! No - Don‘t send me important news/updates. Getting your free copy is easy! Wait a few minutes and check your email for a download link. Click on the link in the email to download your copy! How do you get your copy? It's easy. Simply fill out the form above and we'll email you a link to download your copy - It's as easy as that! Didn't receive your copy? We've made every effort to make sure your download link doesn't wind up in your spam filter but occasionally it happens or, for whatever reason, the email doesn't arrive. If you don't see your download link within several minutes, please contact us and we'll send it to you directly. For a link to download the MQL Handbook.